Physicist Tan Ke Yun et al from the Chinese Academy of Sciences calculated the speed of gravity as between 0.93 – 1.05 % of light-speed. He used two gravimeters coupled to rubidium clocks, one in Mongolia and one in western China, to monitor the tidal phase delay during three eclipses. Dr. Tan Ke Yun found a phase delay in the distortion of the Earth’s surface during an eclipse. The in-elasticity of the earth’s crust also has an effect on the gravimeters. The instantaneous position of the Sun (which we cannot see) averages 8.3 minutes ahead of its optical position. If gravity travels at the same speed as light, the tides will be attracted towards its optical position, rather than its instantaneous position. The moon attracts the tides with a delay of just over a second, since it is much closer than the Sun. Aberration is the change in the effective direction of light or gravity due to their propagation speeds and the motions of the Earth. If gravity has the same speed as light, the Sun’s gravity should approach the Earth with an offset of 20 seconds of arc, towards the Earth’s bow (dawn). This offset should accelerate the earth’s orbit and rotation, whereas the aberration of light only affects the direction we point our telescopes when looking at a star. Children have played with hoops for thousands of years. The left image (above) was painted on the inside of an ancient vase. It shows a Greek lad and his dog running with a hoop. 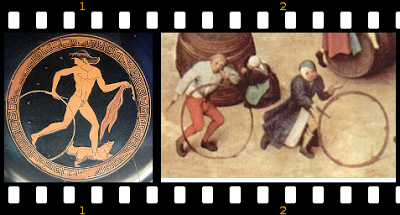 The right image is from a medieval painting by Pieter Bruegel of children playing with hoops. The images are in the public domain – from wikipedia. To roll a hoop, you lightly tap the trailing side with a stick. By changing the angle and the frequency of your taps, you can accelerate and steer the hoop. Solar gravity’s propagation delay would have a similar effect as tapping Earth’s trailing hemisphere. (Gravity pulls, not pushes, but that does not prevent objects from using gravity to accelerate. A spacecraft that passes closely behind a planet, increases its solar-centric speed. If is passes closely in front of the planet, it slows down relative to the Sun.) Solar gravity’s angle of attack pulls slightly more on Earth’s leading hemisphere, which is equivalent to pushing slightly more on the trailing hemisphere. This picture shows how starlight is aberratted by the Earth motion. Gravity’s aberration must accelerate Earth’s orbit around the Sun. Accelerate means our orbit would gradually open outwards – slowly but steadily increasing our distance from the Sun. It would also accelerate Earth’s rotation, since the Earth is spinning without bearings. The number of days in a year should stay about the same, since gravity aberration would shorten days and years together. Jacob claimed his days and years were shorter and worse than the days and years of his fathers (Genesis 47:9). Old people still notice days and years speeding up as we age, but we are trained to reject our memories and believe clocks. The outward pull from the aberration of gravity pushes the outer planets more than inner planets. This is because gravity aberration (its angle of attack) increases with distance. The result is that the planets have logarithmic spacings both in the solar system and in exo-planet systems around nearby stars. Gravity from the planets also pulls on each other (more at each close approach), which can explain why planets and major moons orbit in a plane. Thirty-five hundred years ago, all societies told stories about catastrophically close planet passages and the crushing of a nearby planet. The Bible mentions both events, although it denies that the planets are gods. This would be expected if gravity has a light-speed aberration. Ancient people recorded how the earliest generations lived for eons. Job listed the geological events that passed during a lifetime, in the dinosaur age. He wrote, in chapter 14, that the sea (Hebrew word west) dried. Indeed, drill cores show that the Mediterranean dried eight times leaving thick layers of plankton sandwiched between gypsum and salt. 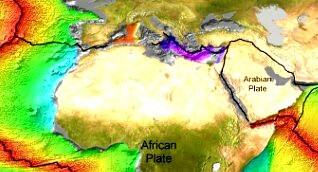 This sea floor age map shows from NOAA, show that at one point, the only ocean on our planet was the Eastern Mediterranean. Another of Job’s markers for the duration of life was: water washes away the dust of the Earth and wears away rocks. The Nile, a few hundred miles from Job’s home, incised a canyon 1 ½ miles deep through granite as it rushed down into the largely empty sea. Later, when the sea refilled for the last time, the Nile created a great delta and filled its canyon with sediments. Clearly eon events happened, exactly as Job explained. Job ended his poem on the duration of life by claiming their faces changed (doubled – shana paniym) before they died. If we lived for geological ages, we would grow Neanderthal brows as we aged. Neanderthal children, who died as infants, had faces more like moderns. Gravity aberration explains why our ancestors lived for vast eons in few days, before days and years accelerated to their modern ephemeral state. 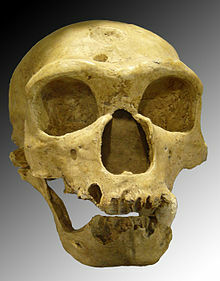 The picture of La Chapelle Neanderthal skull is from wikipedia. The most powerful evidence for accelerating orbits is visible cosmic history. Billions of galaxies grew from tiny globs of formless matter in the heart of each galaxy. According to Genesis, Elohim created the plural heavens and earth first. The Earth, however, was formless until God continued to command light to be. To this day, light dithers (in unbroken continuity) within matter, giving it extension. Half way through the creation week, Elohim continued to form the Sun, Moon and stars into spreading things (Hebrew raqiya). Billions of galaxies intrinsically grew, the stars continuing to form and follow each other out in spiral lanes. The arms of spiral galaxies often have logarithmic spacings, like planet orbits. A scientists might claim, we measure stable, clock-like orbits, however, they used clocks to measure the orbits. NASA used transponders on four spinning spacecraft to return a radio signal generated by hydrogen maser clocks on Earth. The transponded clock rate from hours ago (when compared to the present speed of the atomic clocks) was slower and continued to slow with increasing distance (the Pioneer Anomaly). Evidently all atomic clocks steadily accelerate. The speed at which NASA’s atomic clocks accelerated (relative to distance) was similar to how atomic clocks in hundreds of billions of galaxies increase their speeds with decreasing distance. The fastest atomic clocks are local. The most distant clocked less than 10% of the clock speeds of modern atoms. We observe that the inertial properties of matter change as the clock rates change and its volumetric properties keep increasing as billions of galaxies intrinsically grew into huge growth spirals. Evidently gravity is emergent. It emerges from atoms as they accelerate their clock rates. No wonder the Egyptians painted a red Sun and a tan sky, in the age when the Babylonians claimed to see Venus’ crescent shape. No wonder they built huge pyramids without power tools or engines in few years. Evidently the stone blocks weighed much less in that era and years were longer. No wonder the ancients looked back with longing on the earliest people, those who slept their lives away in the eon age. Carefully examine visible cosmic history to test the idea the Bible predicted for the mockers of the last days. What idea? The notion that all things remain the same. Atomic clocks and orbits are observed to both change in violation of the assumptions and laws of science. Open your eyes and look.